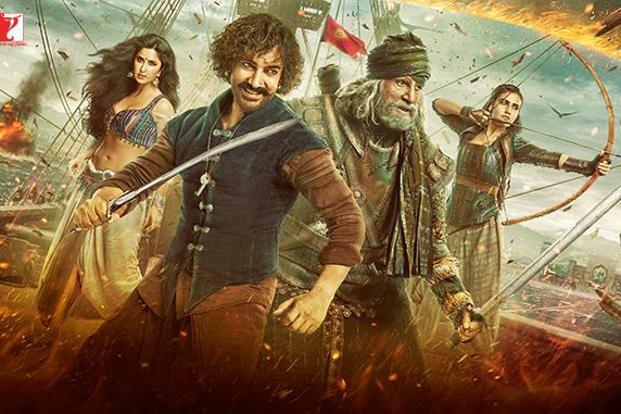 Home Â» Consumer Bollywood throws up disastrous weekend in the run-up to Diwali While Yash Raj Filmsâ action adventure âThugs of Hindostanâ is expected to set the cash registers ringing for the big festive weekend, a bunch of small films hitting screens in the meantime has not done well at the box officeLast Published: Mon, Oct 29 2018. 01 40 PM IST Lata Jha A still of âThugs of Hindostanâ. New Delhi: The clutter of releases is not helping Bollywoodâs box office business in the run-up to the big Diwali weekend. While Yash Raj Filmsâ action adventure Thugs of Hindostan is expected to set the cash registers ringing for the big festive weekend, a bunc h of small films hitting screens in the meantime has not done well at the box office. Crime drama Baazaar starring Saif Ali Khan emerged the best out of a bad bunch at weekend collections of Rs 10.75 crore, growing from Rs 2.75 crore on Friday to Rs 3.75 crore and Rs 4.25 crore on Saturday and Sunday, respectively. Trade website Box Office India pointed out that Khanâs erstwhile multiplex charm is not working anymore. While older films like Love Aaj Kal and Cocktail may not have found takers pan-India but catered well to city audiences, more recent movies like Chef, Kaalakaandi and Baazaar seem to have zero appeal even for metro viewers. Baazaar, with its heavy use of Gujarati, has found low acceptance in the Delhi, Punjab and north India circuit with Mumbai scoring the best in the country at collections of Rs 1.25 crore. Other releases of the week, however, fared even worse. Sharman Joshi-starrer Kaashi-In Search of Ganga was second in line after Baazaar at Rs 70 lakh while Rajkummar Rao and Nargis Fakhriâs 5 Weddings made Rs 50 lakh. Other washouts of the week include Neil Nitin Mukesh-starrer Dassehra, village drama Gaon-The Village No More, Poonam Pandeyâs The Journey of Karma and comedy drama Chal Jaa Bapu that earned Rs 2 lakh, Rs1 lakh, 5 lakh and Rs 1 lakh, respectively, on their opening day. Apart from comedy drama Badhaai Ho and mystery thriller Andhadhun, both Ayushmann Khurrana-starrers, that had made Rs 82.33 crore and Rs 62.91 crore at last count, Bollywood hasnât had the best run-up to Diwali. Other disasters of the month include Salman Khanâs production Loveyatri, Kajol-starrer Helicopter Eela, horror flick Tumbbad, Govinda-starrer FryDay and romantic drama Jalebi that made Rs12.52 crore, Rs 4.29 crore, Rs 7.87 crore, Rs 1.52 crore and Rs 2.34 crore in lifetime box office collections, respectively.